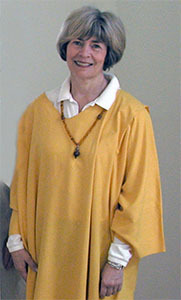 The Banff Sufi Centre is guided by Murshida Kuan Yin Cindy Pujos-Michel. 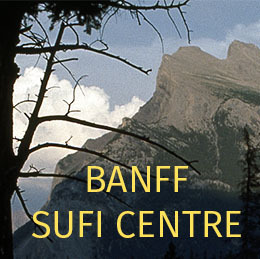 This is a brief overview of our Banff Sufi Centre over the past year, from last August 2017 to August of 2018. After coming back from The Crossing in August 2017, We felt inspired to create another smaller retreat in October at The Buffalo Nations Museum here in Banff. 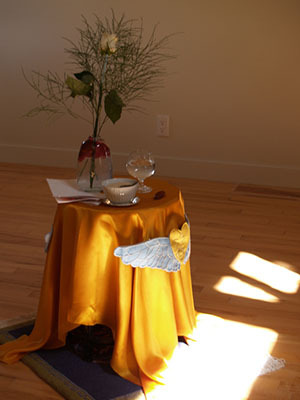 The name of this retreat was, The Journey from Love to Love and the theme was an exploration of the Inayat- Khan family. This was a fairly small 1 day retreat of 13 participants - all Alberta Sufis. David from Edmonton attended in a teaching role. Sitara hosted our Banff Christmas Party in December - 12 beautiful Sufis, mainly from Calgary, Banff and Canmore. A wonderful time was had by all as we heralded in the holy season and the approaching New Year. In early January I began again to hold weekly Sufi Reading classes. Tuesday afternoons, 1:30 -3/4:00pm. We took as our subject matter the book written by Murshid Hidayat, The Inner School. We read the entire book to each other finishing it in late June. We then begin our new and current project, reading and practicing from a small booklet of 20 pages called A Practice Called Shaghal, extracts from the Githas, Sangathas and Sangithas. Last week our Banff group hosted our 2nd Sufi Retreat again at The Crossing at Ghost River. Our theme for this retreat was: Pearls from the Ocean Unseen. 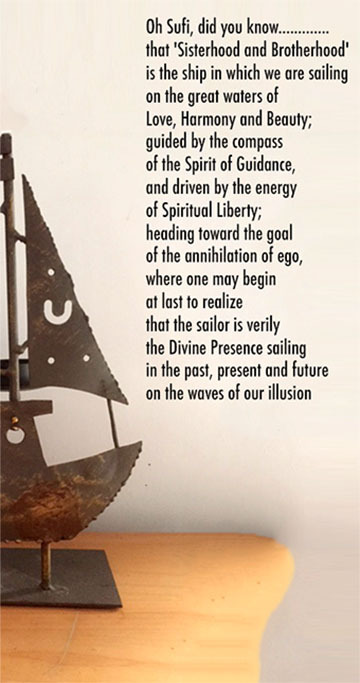 An absolutely lovely and inspirational Retreat, August 30 and 31, 2018. We were 16 Sufis, mostly from Alberta except for our Beloved Nirtan from Victoria and Taliah Kim Washington from Brisbane Australia. So many of our group of participants offered something from themselves - their point of view, friendship, love, support, help along the way. David Murray was again with us and presented a beautiful Universal Worship on day 2. Nirtan gave us a very informative and history filled talk on Baroda, India, the birthplace of Inayat Khan. She showed us the actual 'birthing room' in the family home where Inayat Khan was born. Very interesting and in the true authentic voice of a historian in our Sufi family. I would imagine that things will quiet down a bit now. We will continue on with our Shaghal booklet and look forward to visiting back and forth with our Calgary Sufi sisters. We will hold our weekly readings every Tuesday at 1:30 -3:30/4:00pm. All in all, it was a very busy year for us all as we continue our journey from love to love.